SUVA, Fiji, May 31, 2017 (ENS) – The eco-resorts of Fiji blend the pristine ecology of the blue Pacific with the economical beauty of a simple life. They lead the world’s eco-tourism industry with a formula for sustainability, not solely for the benefit of tourists, nor just for profit. Flung across the heart of the South Pacific, are Fiji’s 333 tropical islands inhabited for thousands of years by some of the happiest people on Earth. The Fijian culture’s caring hospitality springs from an organic, authentic lifestyle close to nature and intimate with the ocean. Yet with climate change bringing rising sea levels, increased frequency and scope of storms, ocean acidification and pollution, paradise found is threatened. Paradoxically, the vulnerability of Fiji and the entire Pacific Island Region can become a leadership strength. Island leaders recognize that economy and ecology go hand in hand, and they have prioritized sustainable development in a way that sets an example for all nations. Fijji and other island states are fragile and vulnerable, yet because of their size and latent state of development, they have a great opportunity to demonstrate true, lasting sustainability. They can serve as refuges for other islanders displaced by rising sea levels. Fiji has embraced the changing times and is planning for and welcoming climate change refugees from neighboring Pacific islands, such as Kiribati, inviting them to make Fiji their home. To finance Fiji’s response to climate change, the business model of eco-resorts and eco-tourism creates a win-win-win situation. Foreigners can enjoy nature’s best, in a rich environment, replete with cultural diversity. Fijians benefit from the jobs created locally, and the economic and tax benefits that flow to the government can help build a more sustainable future. Here are some leading examples. From Nadi, a seaplane takes visitors to Turtle Island Resort, a pioneering romantic honeymoon eco-resort, developed for couples. Visitors can see many of Turtle Island’s eco-design systems from the Turtle Airways seaplane. Turtle Island is one of the leaders in renewable energy systems and in living by the cradle-to-cradle principles of a circular economy. 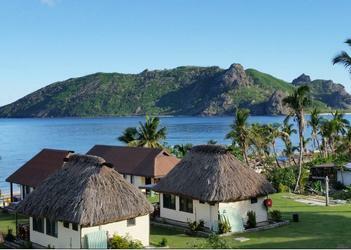 Fijian-crafted thatched roof villas, called bures (say boo-ray), dot the 500-acre island. A with 1.2 megawatt solar farm with battery storage provides 90 percent of the power Turtle Island Resort needs. The bures are hand crafted, carved from island-grown hardwoods with authentic Fijian designs and equipped with all creature comforts. There are double showers, Jacuzzis, and luxurious bathrooms, day beds beside the ocean and hammocks under the palm trees. Intoxicating pure scents of tropical flowers mix with the salty ocean spray. Turtle Island retains the beauty seen in the 1980 romantic film “The Blue Lagoon” because of the way the owners work with water at resort. Rainwater is caught and stored and sea water is desalinated. Turtle Island is the brainchild of American cable television pioneer Richard Evanson, who reclaimed the formerly barren island, removed feral goats, planted thousands of trees and restored its natural beauty. Now flocks of wild parrots, cockatoos, and parakeets inhabit the forests. His son, Richard Evanson, Junior, continues to expand and implement that vision. 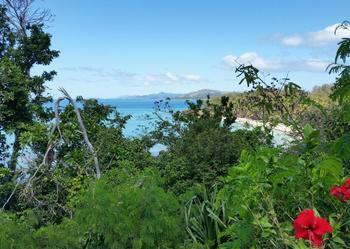 There are guava bushes and passion fruit vines, papaya, soursop and coconut trees. More than 900,000 thousand trees have now been planted at Turtle Island. “Decisions and developments must make financial sense, have environmental integrity, benefit the local people, and celebrate the heritage and culture of place,” said Junior. Upon arrival at Turtle Island, visitors are carried from the seaplane to the shore by Fijians singing local songs, joyously celebrating their arrival with the heartwarming welcome word, “Bula.” Love is freely offered and everything is set up for comfortable sharing in island life. Whether visitors want to kayak or paddleboard into the sunset, sail, scuba dive or snorkel, meditate on the colorful patterns of the fish, or ride horseback; all these activities are available. Guests can learn the Fijian language, prepare local foods, or take a class in Zen and the Art of Opening Coconuts. 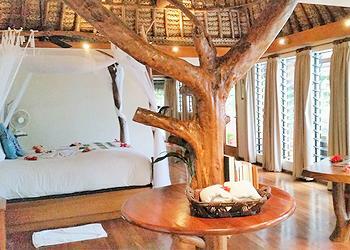 At Turtle Island, intimacy is easy – with a partner, with the orchids, the birds, and the ocean. Honeymoon dreams are fulfilled as guests enjoy private dining on a floating pontoon table for two, while watching the sun set over the ocean. Food director and world-renowned chef Jacques Reymond uses wild caught seafood to create culinary delicacies that feed all the senses. Pacific green lobster, snapper, yellowfin tuna, wahoo and prawns are combined with home-grown vegetables and coconuts from Turtle Island trees. More than the body is fed – community-style meals bond hearts. For the body, there’s a full-service spa. Vonu Spa’s four-hand massages, with two masseurs for one guest, or the Lomi Lomi massage experience is to live for. Everyone on Turtle Island strives to make each visitor feel like family, acting out of a genuine kindness – not because it is their job – but because this is who the Fijian people are. They are happy, so they want to share what makes them feel good. 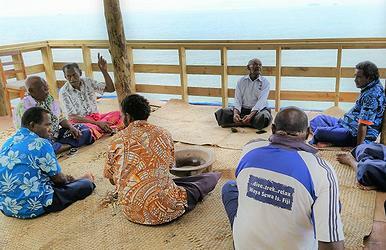 The kava ceremony, talking staff and traditional dances and songs augment the sharing experience. Turtle Island’s Bula spirit gives back to the local communities and supports the education of islanders and special programs such as rugby. This pay it forward approach is the key to eco-resort success. Visitors can island hop through the Yasawa Islands on a convenient boat, the Yasawa Flyer, discovering a multitude of small villages and resorts. Nestled against rocky cliffs on the island of Wayasewa, the beachside Wayalailai Ecohaven Resort is one of the leading destinations. With its simple cottages, Wayalailai Ecohaven is an economical resort, a backpacker’s heaven, with climbing and swimming adventures galore. The resort is rebuilding from damaging hurricanes, which have become more extreme and frequent recently. 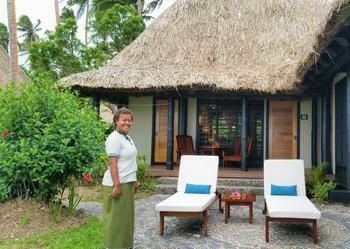 For the rebuilding as well as the hospitality jobs, Wayalailai Resort employs local villagers. 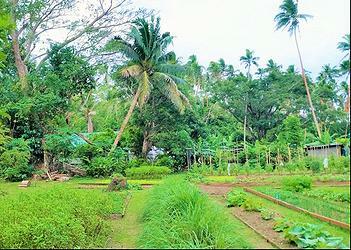 Wayalailai Resort has renewable energy goals. Housekeeping leaves small portable solar panels out on the lawns to soak up the sun and allow guests to charge their phones daily. Most of the village is powered now by a diesel generator, but Wayalailai Resort plans to deploy more solar power, or use biofuel. Wayalailai is owned and managed by Fijians who put their hearts into their offerings, sharing hikes to the island’s peak, community meals, and traditional cultural rituals such as kava ceremonies. Kava is a beverage made from Piper methysticum, a plant native to the western Pacific islands that promotes relaxation and enhances perception. Here, guests celebrated Fiji’s 2016 Olympic rugby gold medal in a traditional kava ceremony with the local chief, where rituals include cupping one’s hands and clapping with rounded palms to keep the spirit held within the hands. During the kava ceremony, this practice is repeated three times. Changed is one’s perception of time, as guests sit on the floor in a circle, journeying deep into bonding with the community spiritually. All sleep well after drinking the natural kava. Wayalailai Resort is wildly popular with backpackers who want an affordable place with the basics, and loved by college age jet-setters out to save and have a good time. It is popular with families on a budget who want to have a beach BBQ, go on a sunset sail, or snorkle with sharks out on the reef. These reef sharks are friendly to people and part of the biodiversity that sustains ocean health. The Jean-Michel Cousteau Resort in Savusavu on the Fijian island of Vanua Levu, offers ocean experiences and educational programs, continuing the legacy of marine exploration that lives on for the whole Cousteau family. The philosophy of Jean-Michel’s father, Jacques Cousteau, comes alive here. The elder Cousteau said, “When one man, for whatever reason, has the opportunity to lead an extraordinary life, he has no right to keep it to himself.” Those words have become a reality down through the Cousteau lineage with his son Jean-Michel Cousteau, who has founded the nonprofit Ocean Futures Society, and his grandchildren. Eldest grandson Fabien Cousteau who founded the Ocean Leaning Center, will open and close the upcoming United Nations Ocean Conference, to be held at UN headquarters in New York June 5-9, coinciding with World Oceans Day. The governments of Fiji and Sweden will co-host the event. The area adjacent to the Jean-Michel Cousteau Resort has now become a marine preserve, and the Cousteau team is working to create more marine protected areas. In Fiji and other areas of the tropical Pacific, many villages have established marine protected areas where local residents don’t allow fishing. Protecting the fish helps control seaweeds that harm the coral, whose presence helps ensure a healthy ecosystem. Enforcing the ban on fishing depends on community support for protecting the reefs. Part of the local culture, this protection offers economic benefits through tourism and spillover of fish to the areas where harvesting is allowed. At the Jean-Michel Cousteau Resort, there is an ocean experience or program for every age. A customary Mama is assigned to every child guest under the age of five for free, and little ones can start in the pool. Older visitors can go for a scuba dive adventure, or just snorkel the reef. More advanced divers can get their Dive Certification from the Professional Association of Diving Instructors, some of the world’s best scuba pros. Resident marine biologist Johnny Singh leads scuba diving and snorkeling adventures, and gives an evening slide show on coral reefs and shark biodiversity. Singh and all marine biologists on staff pass on their passion for ocean stewardship to inspire the next generation of aquanauts. Jean-Michel Cousteau has created L’Aventure, a flagship dive operation at the resort. Visitors can choose from over a dozen dive sites, including Namena Island Reserve, an uninhabited protected area with a fish and bird sanctuary that shelters a rare high-diving seabird, the red-footed booby. Here, visitors can see larger species, including reef, white, and black tooth sharks, tuna, barracuda and stingrays plus hard and soft corals. The Jean-Michel Cousteau Resort encourages birds, animals and native plants to flourish with sustainable resort management practices, using natural plants for pest control, a leading approach among eco-resorts. The drinking water is purified with four stages of advanced filtration and ultraviolet light. The wastewater filtration system is designed with a biodiverse natural pond and wetland for natural self-cleaning. A mangrove reforestation program restores these coastal trees to prevent further shoreline erosion. 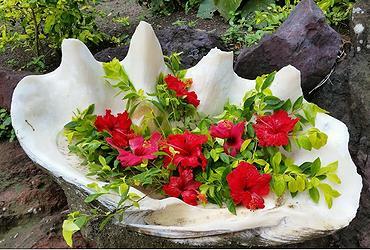 Coral and giant clam farms support the resort’s eco-goals. 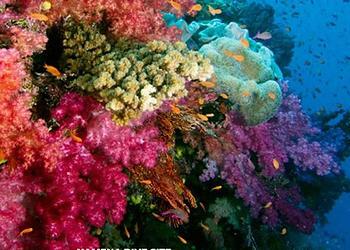 Coral fragments are collected, regrown, and replanted on reefs. Fijians raise the giant clams until they can survive on their own, then transplant them to repopulate naturally over the 100 years of their lifetimes. The food at the Jean-Michel Cousteau Resort is something to write home about. Created from organic gardens, tropical fruits, edible flowers, and herbs growing on the property, the food is pure culinary heaven, Fijian style, with a global influence. Talented Executive Chef Raymond Lee supervises the traditional Fijian “Lovo” feast celebrated every week at the resort with delicacies cooked in the fire pit by hot embers covered with banana leaves. Lee offers a Junior Chef program where young guests can harvest the plants for meals and learn about cradle-to-cradle systems for growing food, such as composting. To minimize energy use, the resort pioneered lighting that uses low voltage LED lighting throughout the main buildings and bures. Lighting motion sensors or timers ensure efficiency, and naturally, the resort recycles. 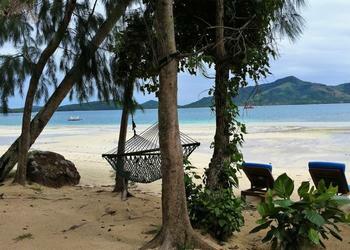 Guests can rent Navia Navia, a private island, for that sacred time alone in paradise. Other guests can enjoy fishing, glass bottom boat rides, snorkeling, stand up paddle boarding, sailing, volleyball, tennis, kayaking, eco-tours, medicine walks, and Fijian storytelling. The medicine walks continue the legacy of Niumaia Kavika, a famous medicine man who worked here to gather and pass on a wealth of knowledge concerning local plants and their healing properties. “True to traditional Fijian culture, the Jean-Michel Cousteau Resort strives to be sustainable, and multi-cultural,” said Simpson. 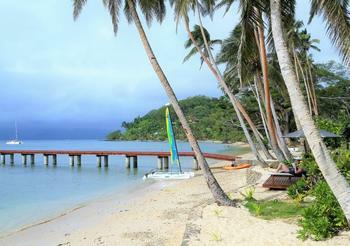 Savusavu Bay offers the oyster and the pearl and also, ocean wisdom. The Cousteau family’s commitment to the ocean is to demonstrate innovative solutions, to educate people, and to be stewards for all the marine species. Koro Sun Resort’s 160-acre sanctuary on the island of Vanua Levu leads in its attention to horticulture and landscape design, and through the integration of cutting edge architecture. With the first and only Fijian floating bures, guests can sleep right on the ocean. In the floating Edgewater Bures, ocean architect Joe Nelson’s design allows guests to dive from their decks into the water, as if from an anchored yacht. A walk through the resort takes a visitor past exquisite ponds with floating lotus flowers reminiscent of Claude Monet’s impressionist garden paintings and landscapes. 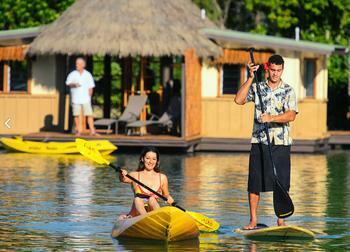 Koro Sun Resort is ideal for large groups on retreat, as there are over 50 guest rooms and villas. Koro Sun offers outdoor showers, enclosed and surrounded by tropical flowering plants for privacy. At the Koro Sun Rainforest Spa the all-natural eco-foot massage with native botanical scrub leaves guests feeling that they are walking on water perfumed with flower essences. Koro Sun’s clear water lagoon supports kayaking, swimming, and an infinity pool that flows over into the ocean offering guests a tranquil scope of the vast ocean and reef systems. Smaller, newer eco-resorts can make a name for themselves by building interesting websites with the help of the Pacific Regional Tourism Capacity Building Program. This opportunity is funded by the European Union and implemented by the South Pacific Tourism Organization. Two staple hotels on Fiji’s main island of Viti Levu, give travelers a breather to adjust to dramatic time zone shifts and jet lag when arriving from overseas. 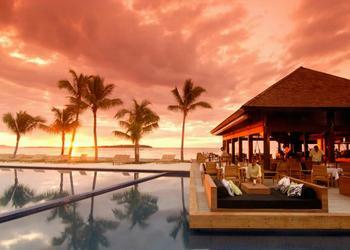 The Hilton Fiji Beach Resort and Spa is on Denarau Island, close to Fiji’s only international airport in Nadi. This destination resort goes beyond the usual franchise model into island luxury and delicacies that add creature comforts, including eco-amenities like solar hot water heaters and recycling. The Holiday Inn is in Suva, the capital, near government buildings, embassies and the business hub. It offers a business center that’s open 24/7, and the buffet incorporates Fijian foods. With the UN Sustainable Development Goals in mind, Fiji’s eco-resorts demonstrate a winning formula for an economic basis to live in balance with nature. By example, Fiji can lead the world toward a green economy with respect for land and ocean. This year, Fiji is in an active leadership position to advance this sustainable development goal. In November, Fiji will host the 2017 meeting of the United Nations climate summit at the UN climate agency’s headquarters in Bonn, Germany, where negotiations will continue on a set of rules for the Paris Agreement on Climate, which took effect last year. “Our Presidency will keep the interests of all nations, including those that are low-lying and vulnerable, at the forefront of our negotiations,” said Fiji’s Prime Minister Frank Bainimarama. Bainimarama said he will highlight the risks faced by low-lying countries in a warming world and sustainable solutions.